30+ residents gathered in the third floor community room of the VNA on Monday May 18th to see design plans for Cedar Street that, officials are hoping, will slow vehicular speed, improve access to Cedar Street from side streets and improve road quality. Tom Bertulis of Design Consultants, Inc. accompanied by Wayne Keefner presented a set of permanent chicanes, one bump-out and one grooved patch to attendees, as well as, offering further data on the unique nature of Somerville that rounded out the presentation. The anticipated raised crosswalk in between the current Community Path and the Community Path Extension to Lowell Street will be installed in mid-June according to City Officials who also pointed out that money set aside by the MaxWell's Green Covenant has been not been utilized. 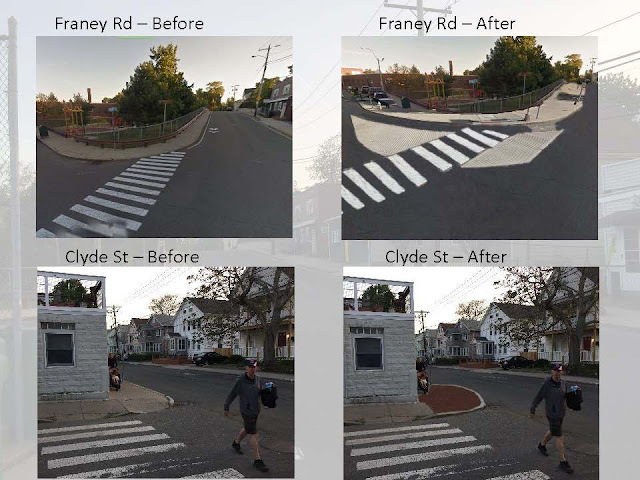 Chicanes painted on Lowell Street were funded out of the City's Traffic and Parking budget and the raised crosswalk will be built with other monies. The presentation included a bump-out at the corner of Clyde and Cedar...a location that residents have complained about for many years. Concerns of parking loss due to the bump-out were quickly squashed as Bertulis informed residents that the size of the addition would not occupy space that a car is legally allowed to park in. It blocks cars from parking too close to the intersection, thus, blocking the view of those accessing Cedar Street. It was the hope of two resident, myself included, that the bump-out would be a green space maintained by the resident who suggested it. Permanent chicanes would be used to slow traffic down from Highland to Broadway and speed cushions would be placed on the corners of Franey Road to alert drivers taking the right to slow down. Residents near the bridge expressed their frustration over speeding cars, as well. The City plans on enforcing the speed limit at this location and are going to see if the implemented chicanes alleviate some of the volume, as well. Chicanes are slated to be installed by this summer/fall during a period of time that sees Cedar Street getting a much needed repavement and sidewalk upgrade. City Officials also promised improved notification to residents and abutters when construction will commence. I have no idea how Lowell and Cedar streets are legally allowed to be 2 way streets... Cedar with parking especially. They ought to make each 1 way streets in opposite directions with safe bike lanes. Kind of ridiculous having such a nice bike path with no safe way to get to it. Even without bikes and in a car I feel like my life is in danger of a head on collision with an oncoming car every time I go down Cedar in the areas with parked cars. There are a lot of streets in Somerville that have no business being 2 way. If the "authorities" are really serious about making Cedar Street; and for that matter all other streets in Somerville, more safer for all motorists and pedistrians as well, they will clamp down on those idiot drivers using cell phones and/or texting while driving. Many times, while driving and traveling in a legal travel lane, or legally stopped at a stop sign or red light, I had to take evasive action to avoid getting hit because one of those idiot drivers either coming from the other direction, or making a turn, that put me and/or my vehicle in harm's way. The long standing situation at Clyde and Cedar-----meaning vehicles parked on the east side of Cedar too close to Clyde---masking it dangerous for a driver exiting Clyde onto Cedar----is not a situation unique to THAT LOCTION ALONE! One could travel all over Somerville and see that same situation all over the city. Actually in violation of the law that states vehicles cannot be parked within 20 feet of an intersection. Hardly ever enforced by the SPD; and Traffic and parking. You must be kind of "new" to the city. Lowell Street WAS made one-way from Highland Avenue to Medford Street/Magoun Square at one time. A continuation of the (current) one-way on lowell from Somerville Avenue to Highland Ave.
For all the right reasons it was made two way again. I agree with the first poster who has complained about the two-way sections of Lowell and Cedar Streets, and I have lived in West Somerville for over 25 years. These streets are too narrow to allow for both cars and bikes to navigate in both directions safely, particularly during peak hours. It makes no sense to paint bike symbols on the same lane that cars have to drive in. That's not a bike lane. It's telling bikes to share the lane with cars, and considering they have to dodge parked cars on alternating sides AND cars going in both directions, that's nearly impossible when traffic is heavy. I hate having to drive down these two streets, because oncoming cars often don't follow posted speed limits and it begins to feel like an obstacle course, not to mention the fact that passing cars are so close you can reach out your window and touch them. Lowell and Cedar should be fully one-way in their respective directions. It would allow for much safer travel, even if it winds up inconveniencing drivers for a time. I would rather have to go a little further out of my way than have to take my life in my hands just to get home.